I am the comics guy in my home city of Medina, Ohio. I’ve been the comics guy in a great many other places and situations as well. I suspect many of you have been the comics guy or gal in your city, neighborhood, office, school, what have you. I’m the comics guy in Medina because I have worked in comics for over four decades, but also because the local newspaper has written about me and my comics garage sales on several occasions. When you’re the comics guy, people expect that you have seen every comics-related movie and that you saw them on the day they opened. They want to know what you thought of them before they take out the second mortgage that will allow them to go to the theater and watch the movie for themselves. I have Medina friends and neighbors who still feel betrayed because I never saw either Man of Steel (2013) or Batman v Superman: Dawn of Justice (2016). I may or may not see them in the near future, but that’s another discussion. “[Though] part of the ongoing Marvel Cinematic Universe, it gave a self-contained story of a hero’s journey from self-centered egotist to selfless hero. Even when he’s playing a jerk, it’s easy to like actor Benedict Cumberbatch, but, by the end of this movie, it’s impossible not to fall in love with him. Again. “Rachel McAdams deserves credit for her understated but wonderful performance as Christine Palmer. She holds her own with such movie heavyweights as Tilda Swinton (The Ancient One) and Chiwetel Ejiofor (Mordo). 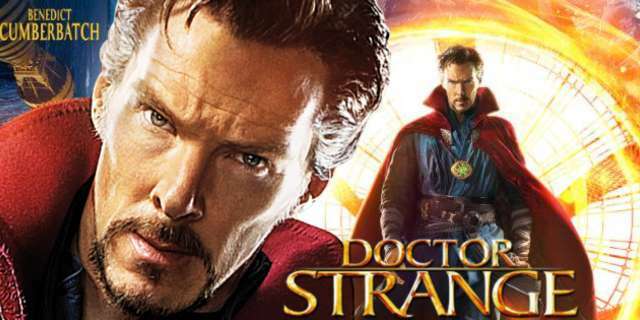 Doctor Strange isn’t available for purchase as a holiday gift, but the movie is still running in theaters. Take a “Marvel Magic” break from all the hustle and bustle of the season by taking someone you love to the film. Oh, yeah, and sit through all the end credits to see the extra scenes. If you’re an old-timer like me and feeling nostalgic for the early years of the Master of the Mystic Arts, or if you’ve come to Doctor Strange via the movie and want to learn more about him, there’s no better starting place than Doctor Strange Omnibus Vol. 1 [Marvel; $75]. This glorious 456-page hardcover book collects the original Doctor Strange stories by Stan Lee and Steve Ditko. Those classic adventures appeared in Strange Tales #110-111, Strange Tales #114-146, and The Amazing Spider-Man Annual #2. As Dean Mullaney writes in his introduction, Doc Strange was unlike the other Marvel super-heroes. His stories started out as five-page episodes not unlike the anthology supernatural chillers that ran in titles like Strange Tales and Tales to Astonish before the coming of the super-heroes. Doc’s origin was a tight eight pages and, for most of his Strange Tales run, his adventures got ten pages and no more. But even the shorter stories introduced readers to amazing characters like the Ancient One, Baron Mordo, Nightmare, and, most especially the dreaded Dormammu. Lee gave a literary weight to the stories while Ditko used his art to created the weirdest worlds of all. With the coming of Dormammu, almost god-like in his power and wrath, Doctor Strange moved beyond his fellow Marvel super-heroes. His concerns were not with saving a city or a nation or even Earth itself. He had become the champion of everything, both the seen and the unseen. True confession. Once I started being able to buy Strange Tales on a regular basis – it was harder to find every issue of my favorite comic books in the 1960s – I read the Doctor Strange stories before I read the cover-featured Human Torch stories. In addition to all that Lee/Ditko excitement, this omnibus volume is packed with special features. Every cover, even if Doc Strange wasn’t prominent on them. Every letters page. Every reprint cover. A gallery of Doctor Strange pin-ups by some of the most astonishing artists to ever draw the Sorcerer Supreme. It doesn’t take a master magician to figure out Doctor Strange Omnibus Vol. 1 is this week’s pick of the week. 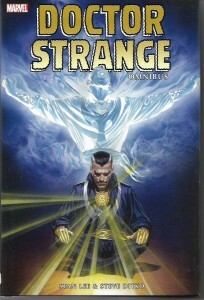 Doctor Strange Omnibus Vol. 1 would also make a great gift for any old and new fan of the character. Don’t let the price scare you on account of InStock Trades, which sponsors this very column, always offers great prices on books like this. May the Vishanti watch over you and your loved ones at this happiest and most mystical time of the year. In keeping with the “magic” theme of this week’s column, I want to share a few quick thoughts about Marvel’s Scarlet Witch #9 [$3.99]. 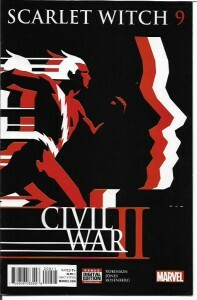 As you can tell by the Civil War II logo David Aja has brilliantly tied into his cover art, this is a tie-in to the crossover event. That the crossover event bores the snot out of me is irrelevant to this mini-review because writer James Robinson actually uses this mandatory involvement to good effect. Robinson is at his best here. He delivers a satisfying done-in-one story that ties in with what’s been going on in the series from the start, with the “magic crisis” shown in Doctor Strange and several other Marvel titles and with this new civil war between the Marvel heroes. Yet none of that overshadows the real story of this issue: a turning point in the relationship of siblings Wanda Maximoff and speedster brother Pietro aka Quicksilver. Wanda’s position on the “civil war” between Captain Marvel and Tony Stark is well thought out, even though it’s a position I disagree with. Her position puts her into conflict with Pietro, which allows Robinson to examine the life-long conflicts between the siblings. Portrayed by artist Joelle Jones and colorist Rachelle Rosenberg, that simmering pot explodes in emotionally-charged images that are nothing short of stunning. Scarlet Witch #9 is a magnificent issue. It’s a fine example of how even “corporate” comic books can rank with the best of our medium. It should be recognized and praised as such.